Laaaazy bones. | MEOW hear this! I suppose that it’s not so much that I’m lazy, because I work two jobs, and by definition alone I think that makes me un-lazy. But this week has been kind of a rough one (nothing horrible, just busy busy busy) so on my off time, which isn’t much, I’ve been a slug. So no posts, because that involves thinking, and I’ve had to do far too much of that this week. Even the cats haven’t done anything interesting. They’ve been their annoying selves, no more, no less. 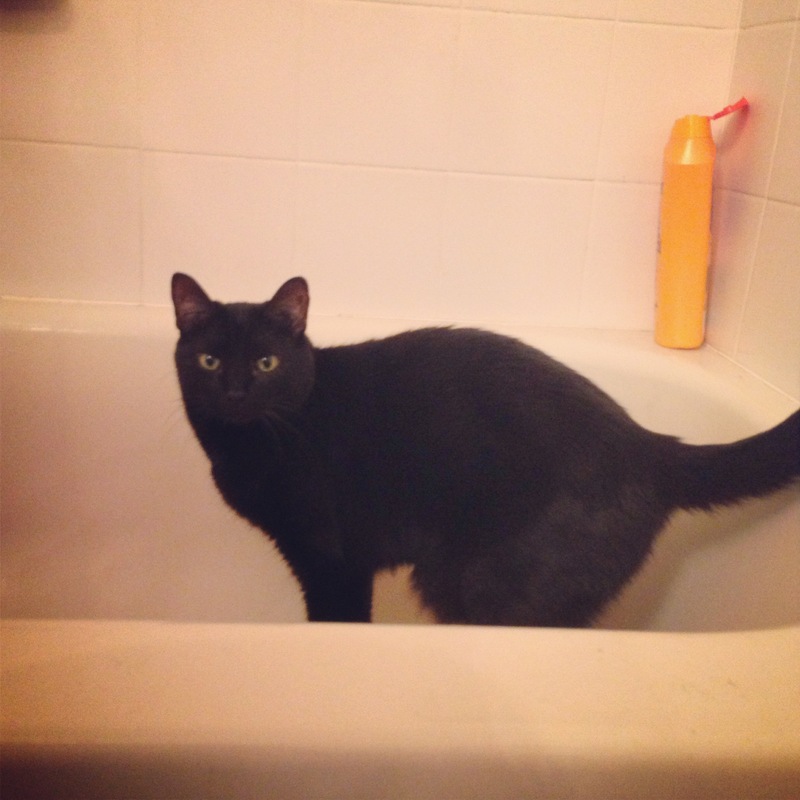 Moosh likes to follow me in the bathroom and jump in the tub for no apparent reason. Moosh kind of has a new thing. It’s not really NEW-new, but he’s doing it now more consistently. He’ll wait outside the bathroom or the bedroom in a spot you wouldn’t really notice him, e.g. on towels on the floor waiting to be washed (they were used earlier in the week to sop up an out of control foaming dishwasher. We thought it was broken until the boyfriend discovered that he’d used dishwashing soap instead of dishwasher detergent. Same brand, and the soap is in a different container than it used to be, he just grabbed and used. Had to shop vac out the suds and rinse with olive oil. Yup, that’s what works. So proud of him. He googled all this himself!) and on top of the scanner on the bookcase attached to the desk (think I’ve talked about this spot before). But anyway, when you walk out and don’t notice him, which you won’t, because he’s black and blends in with every piece of clothing that I have, he meows with the head nod like “Hey. What up?” I think he’s kinda gangsta. So I realize this is the “live long and prosper” sign…but hey, I was on the spot. At least I’m not going to get beat up for flashing some real gang sign. Unless there’s a gang of trekkies who use that. But I think I’m pretty safe. That’s a lovely segue into the only other interesting thing from this week. My newest million dollar idea. This is a good one. I’m going to be a rapper. The fact that I’m not really sure if I can rap is besides the point, I have an awesome rap name. Double C L. Crazy Cat Lady. It doesn’t even matter if you have talent these days, it’s all about the gimmick, and BAM! That’s a good one. So far, only a few of my girl friends think this is a great idea, I asked some of the black guys I work with and they think I’m crazy. I assume ADORABLY crazy. Apparently I’m going to have to market to white chicks. So what if I don’t have a booty? Part of the gimmick. If I can get washboard abs ever, I’ll get MEOW tattooed on my stomach in old english. WHAT WHAT! Weezy ain’t got nothin’ on me. Except, um, money, producers, a codeine habit. Beyotch, I got a kitty habit. Ooh! First rap, right there. This idea will probably go down with all the others, but at the very least, it’s amused me while being lazy. I will end this post with lyrics from 2 Chainz. Because he’s awesome. Moosh meowing with the head bob is precisely what I’ve been dealing with too. I likened it to gangsta’ moves just the other night. We are having a battle of wits. Basically, Petals sits at my feet and stares at me…..I’m not kidding you, for 20 minutes then with the gangsta’ meow/head bob thing until I can’t take it any longer and give her whiska’s treats. It’s torture. Haha at least you know what he wants! Moosh just wants love, I think, and it’s never enough.